Welcome to Movember, brahs. 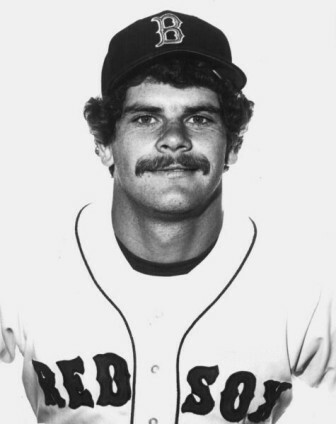 As part of a recurring feature over the next four weeks, Fenway Pastoral will remember some of the most dignified and dapper mustaches to ever grace the faces of Boston Red Sox players throughout the team’s history. Our Day 2 entry is former Red Sox bullpen arm Steve Crawford, who pitched for the team from 1980-1987 and earned victories in both the 1986 ALCS against the California Angels (The Henderson Home Run game) and in the ’86 Series against the Mets. Unlike yesterday’s entry, nice guy Tom Brunansky, this Oklahoma native’s downward facing ‘stache gave him a decidedly less friendly look. That extracurricular, southward turn around the corners of the mouth are by design. They afford an otherwise friendly looking right-handed reliever a certain look of intimidation. Back when Crawford first broke into the major leagues, players – particularly hard-throwing relievers – might as well have been issued this style of ‘stache along with their hats and jerseys in spring training. So while the ‘stache Crawford sported may have seemed like a rebellious expression of badassery, it was actually about as conformist as they came in the early ’80s. Grow your own Steve Crawford if you’re feeling especially docile, or if you’re in the mood for vulturing a win in one of the most famous games in ALCS history. This entry was posted in Red Sox and tagged Steve Crawford. Bookmark the permalink.